Easter is closing in fast and you need the right tools to be prepared this year. 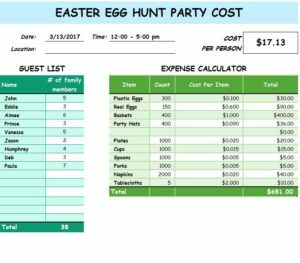 The free Easter Egg Hunt Party Cost is a template that can help you plan the ultimate Easter egg hunt party and save more money at the same time. If you’re one of those people like to all out for the holidays, then this is the document for you. The design is simple and straightforward to use. After Download the free sheet, you’ll see just how easy it can be to customize this template to fit your own needs. You can get started today by downloading the free document and reading the steps below. You can scroll to the bottom of this template and click the file below to start downloading your copy of the Easter Egg Hunt Party Cost template. The next step will be to enter the date and time of your party at the very top of the page so you don’t forget. Proceed to the guest list and estimate the number of people that will be at attendance. The template will add up the people in your guest list to give you a running total. There’s also an examples to show you how it’s done. In the next table, you can start entering your expenses. You will enter the item, count, cost, and the template will total those individually for you. You will also be given a complete total at the very bottom of the template. The document also breaks the dollar amount up by the number of people attending. You would then collect the funds from everyone going to make this an Easter people won’t soon forget!